On Valentine’s Day, 23 couples gathered together at the beautiful Powel Crosley Estate www.powelcrosleyestate.com as the venue for their group vow renewal. They ranged from being married 5 years, all the way to 51 years in marriage. 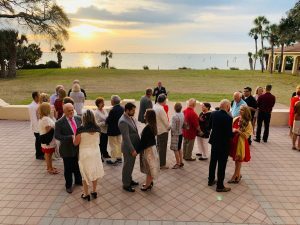 The couples gathered together on the Loggia, faced each other, and with a beautiful view of the Intracoastal Waterway as their backdrop, the couples renewed their vows just before sunset, and were once again, pronounced as husband and wife, by Rev. Rick Lackore of Sensational Ceremonies www.sensationalceremonies.com . Special thanks to Laura with Milan Catering and Event Design https://milancatering.com and the Sarasota Wedding Gallery https://sarasotaweddinggallery.com for coordinating the special event! Congratulations and Happy Valentine’s Day to the happy couples!